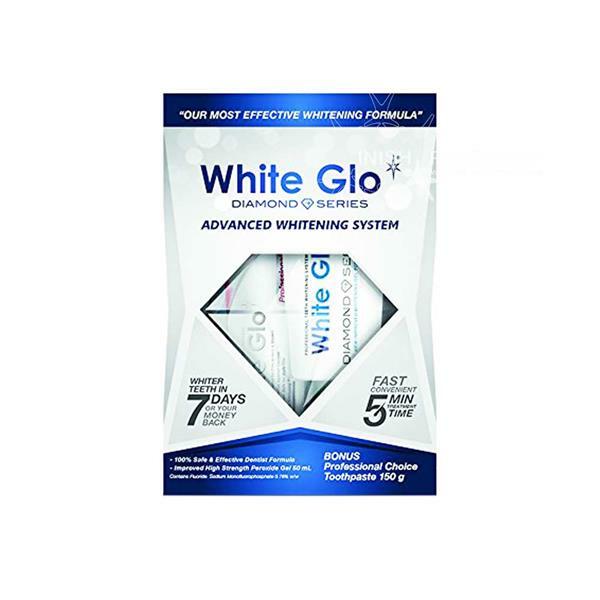 The White Glo Diamond Series Advanced Teeth Whitening System guarantees whiter teeth in 7 days. The fast convenient 5-minute treatment is an effective peroxide-free whitening formula that lifts and removes years of stains and yellowing on the tooth enamel. This formula has been developed by dentists to ensure your safe, fast, effective results for a brighter smiler. Pack includes Whitening Gel (35 Applications), Instant-Fit Mouth Tray and a bonus full size Professional Choice Toothpaste.